Cache (kash) A place for concealment and safekeeping of valuables. A fast storage buffer in the central processing unit of a computer; cache memory. 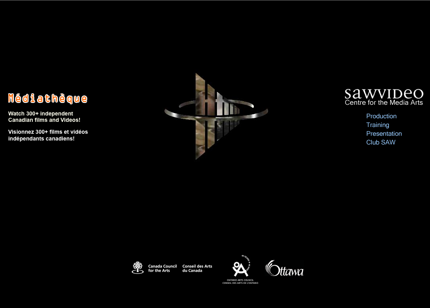 Between December 2009 and May 2010, I met with and interviewed the co-founder of the Mediatheque, Kevin Morris; the project’s digital archivist Anatoly Ignatiev; and the current director of SAW Video (Sussex Annex Works) in Ottawa, Canada, Penny McCann. I also had the opportunity to have many technical questions answered by Douglas Smalley, a technical assistant of the Mediatheque, currently a video preservationist at Library Archives Canada. With a budget of $385,960 (including $100,000 in artist fees) stemming in large part from Heritage Canada, the Mediatheque was a massive undertaking built in record time: on paper, three months was all that was allotted for the project’s creation. In this astoundingly short time, which became just over one year in practice, a database had to be created, partnerships solidified, an interface designed, works collected, contracts signed, works digitized, etc. With an open call, SAW Video collected works directly from artists and from video co-ops across the country. Described as a “mad dash” for artists’ fees, the Mediatheque promised artists a sum of 200 dollars regardless of the length of video,2 exhibited for a three-year period through the Mediatheque portal. Artists were limited to 12 works on the original Mediatheque project. Completed, it featured 486 works by 238 artists. The master copies were retained by the artist, while the digital file for streaming became part and partial of the Mediatheque. The Mediatheque existed as a repository of video art for seven years, streaming full video pieces on the web (rather than samplers/clips), with no master/original material archive as counterpart. In this sense, the Mediatheque project was one that saw the online repository as an entity onto itself, and not a mirror, complement, or addition to any material version of the collection presiding over it. Interviews with those invested in the Mediatheque, past and present, introduce various aspects of SAW Video’s Mediatheque project, focusing here on the eventual server crash that made the project vanish. Nothing of the backend database was backed up. Looking at funding, copyright, and sponsorship (among others issues in the context of the “cache and crash” of the Mediatheque) serves as a springboard into a larger conversation about the intricate if not paradoxical nature of the online Archive. More precisely, these issues inform how the technical is always mitigated to some extent by and through the interplay of legal and archival parameters, and vice-versa. Tracking the Mediatheque from its launch in 2003 to its database crash in May 2009 means following the digital paper trail to link stories, ideals, and absences into the history of Canada’s first large-scale and long standing independent video art repository on the web. The case of the Mediatheque is rare and important for understanding the manifold locus of the online archive: it is past, present, and predictive.3Reconstructing the Mediatheque’s story from cached memory and interviews, the fragments serve to document the project—what it was, what it has become, and what future potential it holds. An approach that accounts for the importance of the “crash” as symbolic of and essential to the online repository as Archive is key to understanding the Mediatheque, past and potential. While it is the cache that makes the Mediatheque’s traces visible and re-visit-able, it is the crash that signals its ongoing archival value, and perhaps, that signals the conceptual if not practical limits of the online repository as Archive. The crash becomes a point of departure, the site of inquiry. 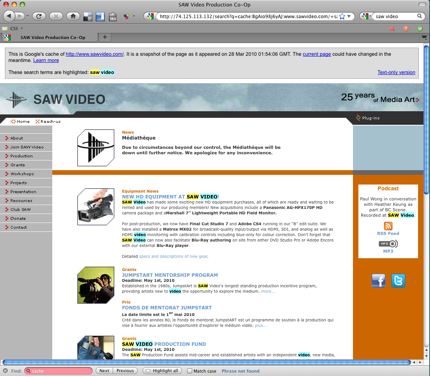 In June 2009, SAW Video’s summer intern sent out a letter to video artists regarding the Mediatheque project and more specifically to communicate the “going down” of the site—including the SAW Video website and the Mediatheque. The letter was written to explain the server crash but also, already, anticipating the Mediatheque’s rebuilding. However, since this outreach effort, a notice on the SAW Video website diverts users: “Due to circumstances beyond our control, the Mediatheque will be down until further notice. We apologize for any inconvenience.”4 Currently, in 2010, plans are underway reconsidering the project, without any move to hastily reconstruct it based on fragments of what it once was. As Smalley puts it, “The Mediatheque web engine (front end layout and backend database) will never be resurrected. It is gone forever. This raises the larger question of how we can go about archiving dynamic web based content that contains dynamic links and content, even executable code.”5 Perhaps, almost a decade later, the Mediatheque cannot exist as it did, and/or its re/creation would pose a different series of tribulations. The crash, then, becomes a moment to pause and reflect on the direction, if not progress, of video art distribution on the web. The story of the crash is at once complicated and simple. Limited funding, complicated corporate affiliations, human error, and legal parameters inform the crash—often reduced or relegated to a mere technical failure—for the Mediatheque, as well as for many if not all similar initiatives in Canada. Because so little documentation exists about the obstacles faced by various online video art repositories in Canada since (and including) the Mediatheque—such as the Video Art component of the Virtual Museum of Canada, VTape’s VTape Digital Bitcasters, and Vidéographe’s viThèque project, as examples (screen grabs below)—not much can be done to argue for a new approach to video preservation and distribution online. But the propensity to crash, by whatever definition, is undeniable for many of the attempts to generate widespread Canadian access of video art online. When the server at iSi Global crashed the Mediatheque, a recent copy of the database could not be found and relinked. While a crash can occur at level of hardware, application, or operating system, little documentation exists at SAW Video beyond an email thread about the May 12 2009 Mediatheque crash that outlined the failures. To this day, video files from the Mediatheque remain housed on a hard drive at SAW Video, duplicate files exist on the iSi Global server in Texas, and the database with all the content (except for some translations) was backed up according to McCann. However, the interface design has all but vanished save for the efforts of the Way Back Machine Internet Archive6, Google Cache, and possibly, older personal back-up files from SAW Video staff and hired designers over the years. Aside from the project’s institutional memory, which is limited in large part to the dozen or so people who worked on the project, promotional materials and a few grant reports, nothing of a coherent collection or context remains. There is also no formal documentation about this project, save for two or three local papers announcing the 2003 launch. Finally, because the Mediatheque is no longer online, it risks generating little interest despite its symbolic and cultural significance for (Canadian) video art history. The Mediatheque lived long enough to experiment with one important thing that is hotly debated today, which would put them at the forefront of online video art in Canada: the legitimacy of ‘free’ distribution of video art online. The longevity of the project meant that the repository would outlive the streaming contracts, which in turn meant that artists were to opt in or out of continuing to showcase their work–this time for free. Canada was the first country (in 1975) to pay exhibition fees to artists, after successful lobbying by Canadian Artists’ Representation / Le Front des artistes canadiens (CARFAC). CARFAC’s lobbying also resulted in the federal Copyright Act Amendment. The Act recognizes artists as the ‘primary producers of culture’, and gives artists legal entitlement to exhibition and other fees.7 Despite this, the Mediatheque tested the idea of fees for a duration, after which the works would become ‘loss leaders’, as defined by Morris. bandwidth costs in 2003, especially for the capacity to deliver video streaming to multiple concurrent viewers online, was very expensive. ISI offered this service and their expertise at a substantial discount for a period of 3 years. It was a fantastic arrangement, as even when the original agreement had run out in 2006, they agreed to keep the archive online at no cost. violated many rules when it comes to preservation: compressed master files, proprietary codecs, insufficient metadata and provenance records, highly volatile storage mediums (i.e. consumer grade DVD-R discs). If the primary goal was preservation, we would have needed to approach things very differently. Furthermore, SAW Video could not afford the streaming costs—the site was visited by over 5000 people a month, and at its height, the demand for the works exceeded 116 00016 —this meant that a corporate partnership facilitated the project which would have otherwise been impossible within the funding budget of Mediatheque. Despite the crash—for which no blame is laid—SAW Video and iSi Global remain on good terms and are considering a future partnership. As demonstrated by the Mediatheque documentation, piecing together fragments of a lost digital repository is an exercise of our era—the web has now existed long enough to have large-scale projects come to life and come to crash. In this strict sense, there is no better time to explore the web’s potential for defining and redefining the role of online repositories as Archive, and more specifically their capacity and limitations for preservation and access. For the time being, the Mediatheque collection remains unavailable, save for its digital traces left in cached memory. Along with a stack of DVDs in McCann’s office, these traces are what remain of Canada’s first large-scale video art archive on the web: the cached and crashed Mediatheque. All images are author’s own screen shots.